Italian songstress Laura Pausini came to Finland to give two concerts in support of her recently released compilation album. She has made a few promotional visits before, but despite her popularity here, she hasn't performed live here before. 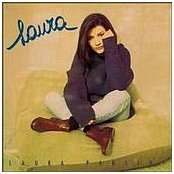 For those who don't know her, Laura's been around from the mid-nineties, and has released albums in several languages but not in english yet - one is in the works though. To date, she has sold some 16 million copies of her albums, and had several hits. Her musical style could be described simply as pop with strong AOR overtones - somewhat close to Celine Dion but thankfully with less "glitter" and more powerful arrangements. And I must add that she has quite an impressive voice, not short of power either! Now onto the "gig"...the start of the concert was a bit delayed thanks to the snowstorm outside, which meant that many of the ticket buyers were still on their way when the show was scheduled to start. Better late than never, Laura and her band started with her latest hit "E Ritorno Da Te", a slowish track. The sound was quite good, and Laura's voice was in fine shape. The band consisted of a "normal" band line up (guitar, keys, bass, drums) added with an extra keyboardist/guitarist and two female backing vocalists, and for a rock fan like myself it was nice to notice that the guitarist was allowed to shine. All in all, a good concert even if some of the songs were a little bland compared to the others. I have to admit that the one song sung in english and written by Richard Marx, "One More Time", didn't really impress me. Sure, a nice melody but a bit too r'n'b styled arrangement for my taste - most of the songs penned by Laura's italian writers were more up my alley. It remains to be heard whether the english album features songs from american songsmiths only and will they push her into the Toni Braxton/Destiny's Child etc. style. I hope not, as I'd hate to hear her lose her style.